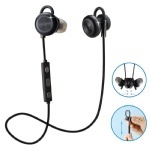 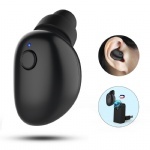 Smallest Invisible Earphone(1 PCS Only): Only 3g, lighter than a one-dollar coin; One-button design, comes with S/M/L ear-tips with anti-shedding features that are suitable for different people; Ideal for calling or listening music in the car driving, meeting, or sports gym, totally release your hands. 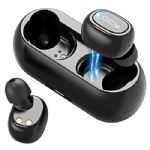 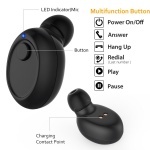 Advanced Bluetooth V4.1: Easy and fast pairing with smartphones, tablets and other Bluetooth enabled devices, connecting with 2 Bluetooth devices at the same time, 33ft(10 meters) wireless range. 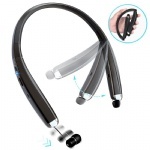 Built-in HD & Sensitivity Microphone: Featuring with acoustic echo cancellation guarantees high quality sound and enables you to call clearly at any places; Seamlessly switch between incoming voice calls and music. 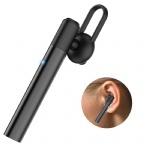 Long Battery Life: 50mAh rechargeable lithium-ion polymer battery, Up to 6 hours continuous talk time or 6 hours music time(60% volume) on a full charge around 1.5-2 hours; Support IOS DEVICE POWER DISPLAY. 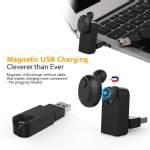 Innovative Magnetic Charger: Compared with traditional charger, magnetic USB charging is much more convenient and creative than ever - No cable or plug needed, just simple put your mini earbud into the right port which contains hidden magnet, then it will attach to the charging thimble automatically. 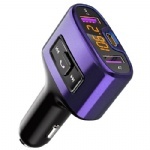 Charge it anywhere with USB port.